Though one of the most important punk bands of all time, Fugazi was also one of the most misunderstood during its heyday. For the simplicity of its ethos—cheap shows and albums, a pronounced devotion to the do-it-yourself ethic, aversion to the trappings of the music industry—Fugazi still engendered a lot of questions during its 17-year run, which ended when the band went on hiatus in 2003. Why were the guys so strict about audience behavior at shows? Was guitarist-vocalist/punk icon Ian MacKaye still straightedge? Did Fugazi think it was superior to more careerist bands who opted for the usual music-industry path? Did all four members of the band live together in a house without heat? That last one comes from drummer Brendan Canty during a scene in Jem Cohen’s Fugazi documentary Instrument. His sister’s friend had heard that rumor, and the band wearily chuckles when he mentions it. It isn’t the craziest thing people have thought about Fugazi. Cohen’s artful film is part tour documentary, part studio diary, part concert film, and part compilation of interviews. Instrument doesn’t simply draw from one tour or one performance, but relies on footage shot over the course of 11 years, from Fugazi’s early days to the peak of its success in the mid-’90s. Cohen and the band spent five years editing together this nonlinear patchwork: Video mixes with Super 8 and 16mm, and shots of the band in the studio segue into slow-motion footage from the road to an interview from some random TV show from years before. It’s a beguiling, mesmerizing film, because it never settles on a straightforward path. It creates a portrait of the band without revealing the whole picture. Through Cohen’s lens (and Fugazi’s music), the mundane tasks and everyday boredom of band life seem unnerving, like during a black-and-white sequence showing the band sitting around backstage then performing while the eerie instrumental “Version” plays over it. That cuts to color footage of the band performing the relatively straightforward punk “Song #1” in Washington, most likely from a different year than what preceded it. 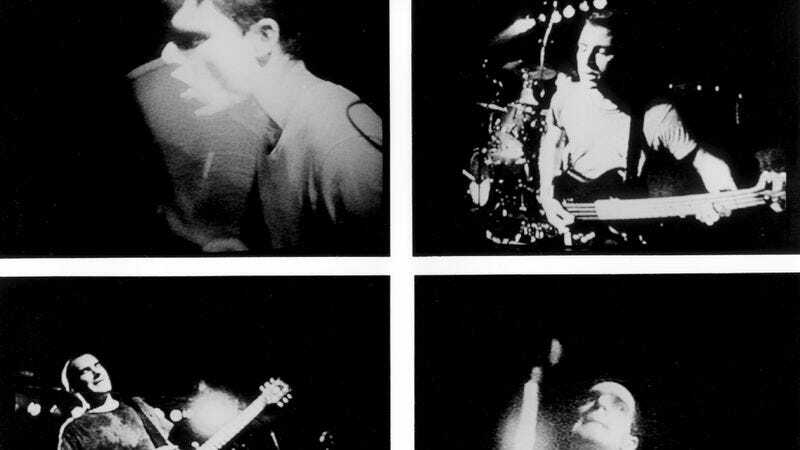 While Instrument offers a ground-level look at Fugazi in numerous situations, it doesn’t probe its members’ lives or provide definitive rejoinders to some of the misconceptions fans have about the band. It tends to let those pass with little commentary, as when a fan at a show erroneously mentions how MacKaye was in Black Flag. At one point, guitarist-vocalist Guy Picciotto says that, eventually, the band’s work has to speak for itself. That notion informs Instrument, which takes its time letting it do just that. Availability: Instrument is available on DVD, which can be obtained through Netflix, and to rent or purchase from Fandor and major digital services.